The Freehand Hotel brings its lauded Broken Shaker concept to DTLA, much to the relief of rooftop-loving Angelenos everywhere. Cool off with eclectic and colorful cocktails—with some equally eclectic and colorful garnishes—and street-food-inspired dishes. Open noon til late, it's a perfect perch to take in views of Downtown, especially around sunset. Three cheers for the proliferation of rooftop bars in downtown Los Angeles! 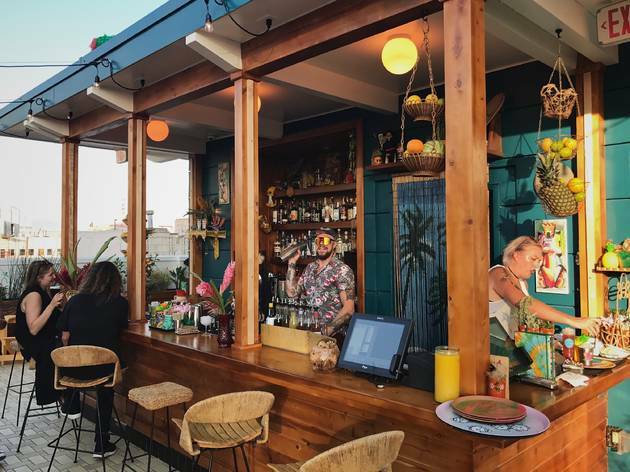 Whether you're Upstairs at the Ace, at Nomad, The Standard, or Broken Shaker--there truly can't be too many rooftop bars, more please! Broken Shaker is large, sunny space, dominated by a pool and an eye-pleasing array of bright pastels pops of color from the seating and decoration. The menu is filled with creative sounding drinks, and given the spread of novelty swizzle sticks on the bar, you will want to try many. That said, drinks are running at typical hotel prices here, with the stereotypical amount of alcohol in them to boot. They're tasty and pretty, but similar to the Ace's in the way that they price at the higher end of LA's cocktail price spectrum, while having a little less than what one would expect in alcoholic content. Additionally of note--the bar decor. The longer we sat at the bar, and the more that we examined the decor, the more uncomfortable we felt. At first glance, Broken Shaker is tiki-esque. 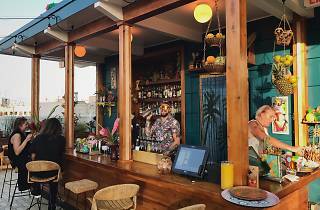 Upon closer examination, however, it's not just using tiki style decorations (which could merit their own cultural discussion, but at this point, Tiki is an established and celebrated bar subculture). "Why is there a dream-catcher up there?" "That skeleton looks like it was ripped from Dia De Los Muertos." At least one (or two?) pieces of art have African women on them that feel rather like they're on display. We even noticed the wall across from the bar was painted with what could've been categorized as "caveman"-style art--handprints and simple figures. There was a small Frida Kahlo altar off to one side. While the bar could've been making a statement on the hipster appropriation of cultural pieces and art for pure aesthetic reasons, it felt more like the type of place that would be the subject of that analysis--a thoughtless appropriation of recognizable cultural symbols from what one could consider historically marginalized communities in the USA. It would be one thing if there were authentic handicrafts on display--"Wow look at that ___, I wonder where that came from," but everything on display seemed to be something that could be considered an obvious callback to what 100 years ago would've been referred to as "exotic" or "tribal" culture (or in the case of prehistoric art, "primitive"). We kept trying to find a thread to tie the pieces together--"Are these all pieces from coastal communities?" "But what about the dream catcher..."--but we simply couldn't find one that managed to include cave painting and Frida Kahlo (someone whose art is constantly appropriated). We were curious if the other Broken Shaker locations around the country shared the same decor and were surprised to find little mention of these decoration decisions. The rooftop bar is a lovely place to catch some sun (not a ton of opportunities for shade in fact) and treat yourself with a delicious, brightly color drink, but if you start to examine your surroundings, beyond the simple pleasures of being elevated above the city, it can be an odd experience.